Picture taking with the elementary and high school student delegates. July is always a memorable month for me. This is the month of my birthday, and also marks the anniversary of when I started kendo way back in 2002. I started training as a birthday gift to myself, and I have always been thankful that I took the time to start practicing the art. So this month always serves as a double celebration for me. In addition to that, July is Philippine-Japan Friendship Month, so many events connected to Japanese culture always happen during this month. Sometimes they are related to budo. I have been lucky enough to watch different budo demonstrations over the years, as local and foreign practitioners showcase their respective arts. There are also those few lucky times when I am part of the team doing the demonstration. Last Monday, July 28, was one of them. We were invited by PHILAJAMES (Philippine Association of Japan Government Scholars) to conduct a demonstration in their event, entitled: Bridging Cultures Through “Sustainable After-School Programs”. 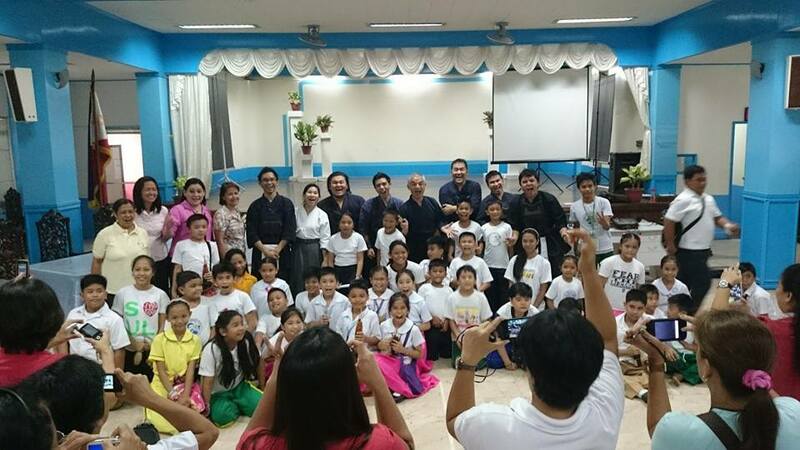 It was essentially a seminar/workshop, introducing selected elementary and high school students, and faculty of the City of Manila to various extra-curricular activities common in Japanese schools. They decided to showcase kendo as part of this, so Ms. Gilda Uy, the current president of PHILAJAMES, contacted us about helping them out. So that morning on July 28, the ten members of the demonstration team found ourselves crammed into two cars making our way to P. Gomez Elementary School, where the demonstration venue was. After getting slightly lost, we made our way into the venue where we were greeted by the sight of many waiting kids, their parents, and teachers. Waiting for the demonstration to start. After we set up and went through the opening ceremonies of the event, Igarashi-Sensei started things off with a lecture on the history and basics of kendo. This was immediately followed by a kata demonstration by him and myself. I must admit though, the kodachi kata was a bit of a failure due to lack of practice on my part. Still, it was enough to sufficiently impress the audience. The kata demo was followed by other members of the demo team showing the three basic waza: men, kote and do. Then we did an uchikomi-keiko demo, with me serving as the motodachi for everyone else. I must admit I didn’t realize how slippery the floor was, so I accidentally knocked down the first two aite, before I caught on that taitari shouldn’t be done. It was a great event. Students, parents and teachers were all treated to a Japanese culture experience that they have not experienced previously. Everyone had fun, judging from the enthusiastic screams of “I WANT TO TRY!” and the smiles from the students. And as someone trying to promote kendo in the country, I was gratified to be approached by a number of teachers asking how would it be possible to set up clubs in their schools. To see more pictures of the event, please click here. This entry was posted in About, Events, Instructors, Kendo, Socials, Stories / Testimonials and tagged demonstration, Gilda Uy, Iga ken, Iga Kendo, IGA Kendo Club, Igarashi, Igarashi Sensei, Japan, kata, keiko, kendo, Koji Igarashi, Manila, Martial arts, P. Gomez Elementary School, PHILAJAMES, Philippine Kendo, Philippine-Japan Friendship Month, Philippines, workshop. Bookmark the permalink.